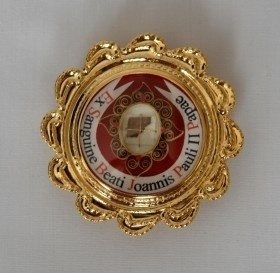 Over the weekend, thieves apparently not-too-concerned about booking a place in heaven, stole a relic that contained a piece of gauze that was once soaked with the blood of late Pope John Paul II. Church officials at the isolated San Pietro della Ienca church in the Abruzzo region of Italy reported the burglary. The small church housed the relic that is one of only three in the world. According to the BBC, the relic was not heavily guarded, as the thieves were able to break through the iron bars and a window protecting the display. The burglars also took a crucifix, but left the church’s collection box untouched. Be on the look out for pope clones, or perhaps Baphomet, or maybe just deranged billionaires with collections of bloody gauze. Who owns Curt Shilling’s bloody sock? This entry was posted in installation / sculpture and tagged blood, cloning, crime, popes, religion on January 28, 2014 by jonathan.